John L. Hill began thinking about the H-15 design in 1948; however, it wasn’t until the early 1960’s when, caught in a snowstorm in Denver in a machine shop with nowhere to go and nothing to do that the first H-15 was made. It is a shot-barreled submachinegun designed to be used in one hand or fired two-handed like a large pistol, though a folding wire stock may also be attached to the weapon. The most striking aspect of the H-15 is the magazine; it is a large clear plastic box that sits atop the weapon with the rounds contained sideways within it, in exactly the same manner that the Belgian FN P-90 submachinegun would use some 30 years later! It is sort of a "semi-bullpup" design, with the magazine behind and above the pistol grip, and with a barrel which, though short, is longer than one might expect from looking at the weapon. The experimental weapons he produced had no manual safeties of any sort, though there were some automatic safeties. Unfortunately, the rather draconian gun regulations present in the US at the time prevented Mr. Hill from making many fully-automatic versions of the H-15, and he could not interest any police or military agencies in the rather novel weapon. He was basically ahead of his time. 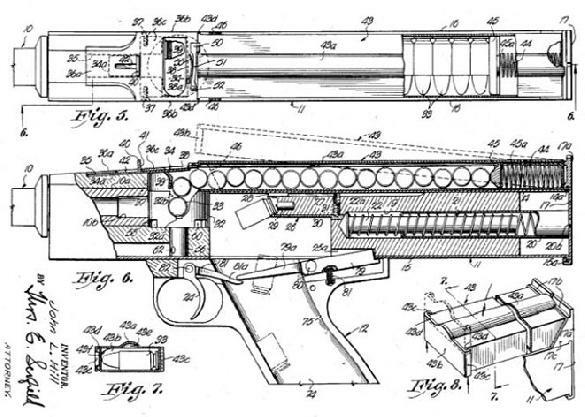 Perhaps 90-100 of these weapons were built, mostly semiautomatic, and only 10 or 11 examples remain in existence today; some full-automatic samples were built by FRANKFORD ARSENAL for US Military trial, but their status remains unknown at this time. Most of these were made to fire the .9x19mm-Parabellum (with an average weight of 2,27 Kilograms), but some .380-ACP versions were also built (with an average weight of 1,81 Kilograms). The H-15 remains a great example of how ingenious a private arms manufacturer can be. More informations and pictures about the HILL H-15 submachinegun are to be found on the March 2004 issues of SMALL ARMS REVIEW.